Our used Auto-Sleeper Broadway EL Duo was sold new by us in 2012. It is a lovely example, in great condition with low mileage and has been maintained by us too. The Broadway EL Duo has a popular layout featuring an end lounge with twin, long sofas that will convert, for sleeping, into either 2 good-sized single beds or a large double. There is a really useful drawer unit and table between the sofas and storage below the sofas and above in overhead lockers. The kitchen features a 4-burner gas hob with below, a combined oven and grill and 3-way fridge with built in freezer compartment, there’s even a microwave too and plenty of work surface. The bathroom, opposite is Auto-Sleeper’s swing-wall system which allows plenty of space for washing and the toilet but also swings through 90 degrees dividing the room and allowing a fully enclosed shower to keep the rest of the room dry. For the driver there’s cab air conditioning, cruise control, a colour reversing camera, electric windows and height adjustable seats with armrests. Both cab seats will swivel around and there’s even a simple pedestal table that fits between when required. Outside, our Broadway has rear wind-down steadies for stability when on-site, alloy wheels, a flush fitting wind-out awning, external TV plug-in point, 30w solar panel, TV aerial and 2 bike cycle rack. This Broadway is a lovely example and ideal for a first-time buyer or for more experienced users. 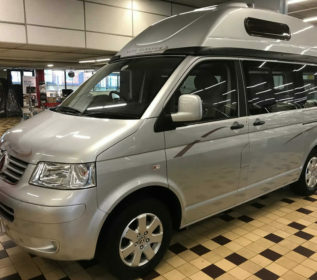 The Auto-Sleeper Trident is a short wheel base Volkswagen camper van with a fixed, high roof. It is designed to be able to travel with 4 people, all in seat-belted seats. This model has sleeping for 2 but could be adapted to sleep 4 or accept a drive-away awning for additional space or sleeping. The Trident is manufactured by the UK’s leading motorhome manufacturer, Auto-Sleepers and has been produced for over 30 years – and it’s still as popular as ever! This Trident was first registered in 2009, is automatic, has had just 1 owner from new and has covered 44,750 miles. It is finished in metallic Silver with Slate coloured cabinets and fabrics. The Trident has swivelling cab seats and a “Rock and Roll” style rear seat/double bed. Our Trident specification includes fully automatic transmission, cab air conditioning, cruise control, electric windows and mirrors and removable carpets too. The cooking space is quite comprehensive for a camper of this size and includes a 2-burner gas hob with gas grill below. It also has a useful 3-way fridge with small freezer compartment too. Above the worktop features a sink with running, tanked water and a practical sunken drainer too. There is plenty of internal storage for a camper of this size too and a very useful porta-loo housed in one of the lower locker compartments. The high roof has additional storage space and great internal roof height when camping. Being a fixed high roof adds both security and insulation meaning the Trident is a true all-season camper. Every side window is made from glass and bonded to the body; 2 feature opening (sliding) windows. As with all Tridents, it has a handy, opening rear tailgate. Finally, outside are alloy wheels, water filler, electric hook-up point, TV aerial and an external TV plug-in point. Please come and have a look at a real multi-purpose and true, classic, campervan. This Used Auto-Sleeper Nuevo EK 2 Berth 2006/56 really is a lovely, compact 2 berth coach-built motorhome. 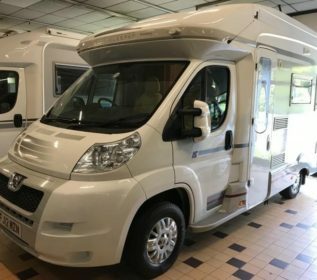 The Nuevo EK is a short wheelbase, end kitchen, 2 berth motorhome by Auto-Sleepers, the UK’s oldest and leading, luxury motor home manufacturer. Our Nuevo is built on a Peugeot chassis with their 2.0 Hdi turbo diesel engine and 5 speed manual gearbox. The Auto-Sleepers Nuevo EK has a very popular 2 berth since launching back in 2002. This one, being so nice and keenly priced will be very popular indeed. We are very lucky to be able to offer this part -exchange for sale. Our Nuevo has covered just 25,100 miles and has been very well looked after both inside and out. We would urge anyone to come and have a look soon – don’t hesitate, you will miss it. Both cab-seats swivel for practical living and added comfort. The lounge features twin, opposing sofas while the kitchen is to the rear, along-side the corner shower-room. There are ample storage lockers and a good-sized wardrobe. Opposite this is the 3-way fridge with built-in freezer compartment. The compact and very comfortable lounge converts to become either 2 single beds or 1 double bed. Over the cab is a large, useful storage locker while there are several further overhead lockers in the lounge too. The Nuevo kitchen is very well equipped featuring a full- size cooker with dual fuel hob, an oven and a grill. It also has a sink with hot and cold water, ample work surface and cupboard space and there’s a fire extinguisher too. Outside, this Nuevo has an awning, TV aerial and a cycle rack. On the roof is a solar panel. A colour coded front bumper and rear and side skirts finish off the great looks of our Nuevo. Finally, our Nuevo EK has electric cab window and mirrors, as well as a quality alarm system and reversing sensors. The furniture is finished in lovely light oak with fabrics in attractive, patterned Beige. 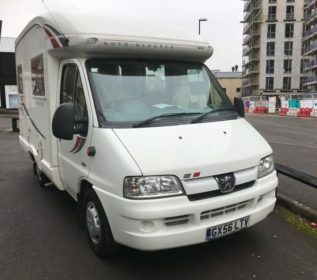 This is an inexpensive, lovely motorhome; it will certainly be sort after and is priced to sell so make your enquiry today.